Cranfield University researchers Stephen Hallett and colleagues Ron Corstanje and Simon Jude have become recipients of research funding through the recent NERC ‘Big Data Capital Call’ to procure various scanners and software tools that will allow the Cranfield team to capture in digital form the various unique, natural environment ‘big data’ collections held at Cranfield University. In particular, this includes the WOSSAC (World Soil Survey Archive and Catalogue) facility, which holds tens of thousands of environmental resources and artefacts from some 280 territories worldwide (www.wossac.com). The scanning equipment will enable the liberation of these historical high-volume data, currently locked in analogue form on paper, film and tape as Open Educational Resources (OER) for research and learning and teaching in the UK and abroad. 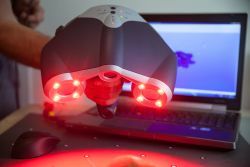 The equipment includes a high precision 3D laser scanner, an automated bookscanner, and a microfilm scanner, as well as additional computing server capacity. The award also includes a state-of-art ‘virtual reality’ suite comprising a 3D back projection system with tracking headsets and hands-free controllers for 10 delegates. Once scanned and digitised, the WOSSAC data and other related information can be drawn together in modelling and visualisation environments. Using the equipment, Cranfield University will build on its extensive expertise in the innovative handling of large quantities of complex spatio-temporal data on the environment, soils and land information, and will draw on a broad experience in decision-making and perception research, particularly in relation to scenario-driven environmental futures, exploring impacts from novel and emergent risks. Spatio-temporal data visualisation can provide a critical link between natural and physical sciences and social sciences/decision-makers and can lead to new insights. The visualisation ‘virtual reality’ environment, designed for the geosciences, will allow both the tools for exploration of multi-dimensional ‘big data’ as well as new and powerful means to convey results and analyses, and to communicate risk and uncertainty to potential beneficiaries of research. This entry was posted in Big Data, Visualisation and tagged 3D scanner, ActiveMove, Book scanner, Covergold, Creaform, GeoVisionary, Microfilm scanner, Virtalis on December 16, 2013 by admin.